Save big when you combine select internet plans and DIRECTV packages. Plus taxes. For 12 months w/ 24-mo. agmt. Autopay & Paperless bill req’d. $81/mo. in months 13-24 (subject to change). No matter your TV preferences or budget, DIRECTV has plans and packages to keep you happy. Whether you’re a sports fanatic, movie lover, or news junkie, select the perfect package for you and watch anywhere in your home. Name your sport, DIRECTV sports packages have the channels you need to keep you on the edge of your seat. Watch exclusive coverage and out-of-market games with NFL SUNDAY TICKET and the RED ZONE CHANNEL® (only available in HD) on all your devices. Plus, stream live baseball with MLB TV, get all the basketball you want with NBA League Pass, and keep tabs on all your favorite soccer teams with as many as 300 regular-season MLS and international matches on FOX Soccer Plus. Other sports channels, including NHL® CENTER ICE®, are also available. With DIRECTV channels, you can keep up on all your favorite premium programming, including the most popular TV shows and movies. Plus, get the first 3 months of HBO®, Cinemax®, STARZ®, and SHOWTIME® included at no extra cost. 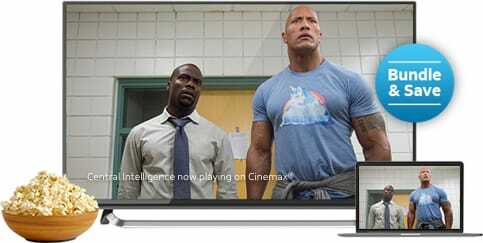 Get instant access to over 35,000 shows and movies to watch anytime, anywhere* at no extra cost from networks including DISNEY, ESPN, AMC, SHOWTIME®, and Cinemax®. 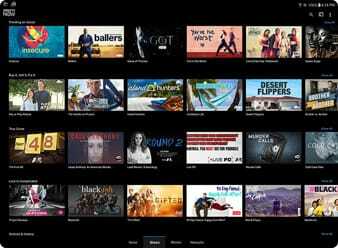 Just connect your DIRECTV HD DVR and enjoy the hottest movies and shows as soon as they’re available, and even watch your favorite shows after they’ve aired. You can also catch up on local channels and news stations available in most areas of the United States. If you’re a movie buff, you’ll love DIRECTV movie channels. Watch the latest blockbusters soon after they’re released, along with new movie premieres every weekend, and 8 Cinemax® channels with DIRECTV PREMIER®. You’ll also get access to more than 1,000 popular movies available on STARZ®, and even more favorites with HBO® and SHOWTIME®. No matter your favorite movie genre—from comedy to horror to romance—DIRECTV has you covered. *Availability of content varies based on programming package subscription. Actual number of shows and movies will vary. Additional fees apply for new releases and certain library titles. **Eligibility based on service address. Not all networks available in all markets. When you see everything that DIRECTV offers, it's easy to understand why DIRECTV has been rated #1 in customer satisfaction over cable for 18 years running. When it comes to cutting-edge technology, the DIRECTV Genie HD DVR is in a class of its own. One HD DVR powers your entire home*, so you can enjoy a full HD DVR experience on every TV in your home without seeing any inconvenient cable boxes. ** GENIE DVR allows you to record up to 5 shows at the same time, and even catch up on select shows you missed within the last 72^ hours. You can also record and store up to 200 hours of your favorite programming† to watch later, and restart a show that you paused. *Add’l equipment and fees req’d. ^ Features available on select channels/programs. Internet-connected HD DVR (model HR20 or later) required. † Actual recording capacity varies based on type of programming being recorded. Once you set up an appointment for your DIRECTV installation, a certified technician will come to your home and install all necessary equipment—an adult 18 years or older must be present. 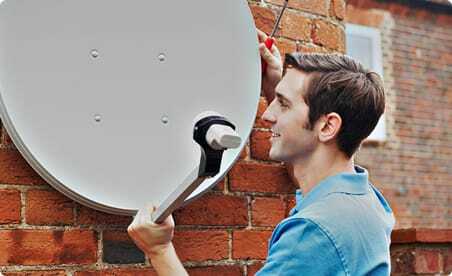 The technician will determine the optimal location for your DIRECTV dish, and discuss it with you before installing. Professional installation is included for up to 4 rooms,* and additional installation options are available depending on your needs. *Installation: Standard professional installation included in up to four rooms only. Custom installation extra. Applicable use tax adjustment may apply on retail value of the installation. Odds are that every member of your family has different interests and TV preferences. That’s what makes DIRECTV so great—there’s programming for everyone, ranging from sports to the Food Network to DISNEY for the kids. 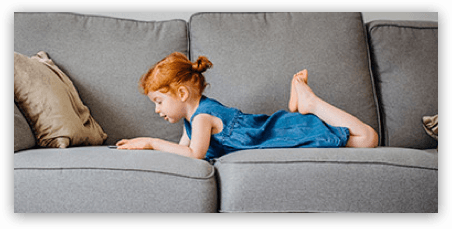 DIRECTV prices and packages are also designed to fit your budget and lifestyle, including the option to bundle DIRECTV with your AT&T Internet service. 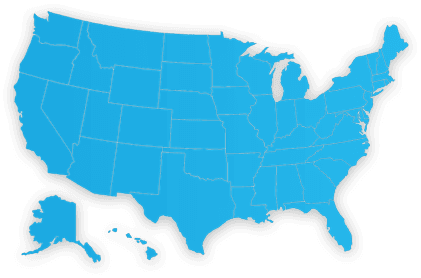 Curious about DIRECTV availability in your area? Luckily, DIRECTV is available in all 50 states—so you can get the ultimate entertainment experience from coast to coast. You can also count on 99% worry-free signal reliability*, and watch all your favorite shows uninterrupted. *Wireless reliability based on third party data. DIRECTV signal reliability based on nationwide study of representative cities. Internet reliability based on U-verse High Speed Internet service. Customize the perfect entertainment package with DIRECTV bundles, and save money doing it. With AT&T you can get high speed internet with over 99% reliability, bundled with the 99% worry-free reliability of DIRECTV for entertainment you can count on.1 You can also add qualifying wireless plans or home phones to your bundle to forget the hassle of juggling multiple bills and manage all your services on one simple statement. Viewers also share the benefit of watching select DIRECTV HD channels in 4k Ultra HD resolution2—so you can skip the theater, grab the remote control, and sit back and relax in the comfort of your own home. 1 Claim based on U-verse High Speed Internet service. DIRECTV reliability based on a Nationwide Study of representative cities. 2 Limited programming available. 4K equipment, minimum programming (SELECT Package or higher), 4K account authorization and professional installation required. Other conditions apply. With DIRECTV you’ll get 99% worry-free signal reliability† to paperless billing, count on DIRECTV to make your life easier. Looking for a Stand Alone Streaming Option? Annoying cables, contracts, and credit checks are a thing of the past. You’ll enjoy over 60+ live channels and take your pick of packages. Plus, enjoy On Demand titles, and stream all your favorite shows on just about any device anywhere in your home. You can even add premium programming (including Cinemax® and HBO®), and cancel your service whenever you need to. If you’re a residential customer using satellite TV, you might wonder how it works. First, you need a satellite dish with access to the sky, which DIRECTV professionals install for you outside your home. * Your satellite dish receives digital transmissions from direct broadcast satellites in space. Your receiver, or set-top box, converts the signal and displays your favorite channels right on your TV screen. DIRECTV is the #1 satellite TV service in the country—so you can get 99% worry-free signal reliability† to watch all your favorite programming without interruption. 1-YR ALL-INCLUDED OFFERS: Ends 6/30/19. Pricing: All-Included TV pkg pricing includes monthly fees for one Genie HD DVR and standard prof’l installation. $5/mo. discount: Must enroll in autopay & paperless bill within 30 days of TV activation to receive bill credit starting in 1-3 bill cycles. First time credit will include all credits earned since meeting offer requirements. Must maintain autopay/paperless bill and valid email address to continue credits. No credits in 2nd year for autopay/paperless bill. Pricing subj to change. $35 SELECT All-Included Pkg: 1st & 2nd year pricing: $35/mo for first 12 mos only. After 12 mos. or loss of eligibility, then prevailing rate applies (currently $81/mo) unless cancelled or changed prior to end of the promo period. $45 CHOICE All-Included Pkg: 1st & 2nd year pricing: $45/mo for first 12 mos only. After 12 mos. or loss of eligibility, then prevailing rate applies (currently $110/mo) unless cancelled or changed prior to end of the promo period. $75 1-YR BUNDLE: 1st & 2nd year pricing: $75/mo for first 12 mos only. Includes SELECT All-Included pkg, Internet speed tiers (10M to 100M) & Wi-Fi Gateway. After 12 mos. or loss of eligibility, then prevailing rate applies (currently $121/mo. ), unless cancelled or changed prior to end of the promo period. $85 1-YR BUNDLE: 1st & 2nd year pricing: $85/mo for first 12 mos only. Includes CHOICE All-Included pkg, Internet speed tiers (10M to 100M) & Wi-Fi Gateway. After 12 mos. or loss of eligibility, then prevailing rate applies (currently $150/mo. ), unless cancelled or changed prior to end of the promo period. $94.99 1-YR BUNDLE: 1st & 2nd year pricing: $94.99/mo for first 12 mos only. Includes SELECT All-Included pkg, Internet speed tiers (10M to 100M) Wi-Fi Gateway and Phone Unlimited North America. After 12 mos., then-prevailing monthly rate applies (currently $140.99/mo. ), unless cancelled or changed by customer prior to end of promo period. Must maintain all qualifying services and service addresses must match to receive advertised pricing. Exclusions: Price excludes taxes, applicable use tax expense surcharge on retail value of installation, equipment upgrades/add ons, and certain other add’l fees & chrgs. Different offers may apply for eligible multi-dwelling unit customers. Offers may not be combined with other promotional offers on the same services and may be modified or discontinued at any time without notice. Other conditons may apply to all offers. $75 1-YR BUNDLE PRICE: Ends 6/30/19. 1st & 2nd year Pricing: $75/mo for first 12 mos. only. After 12 mos. or loss of eligibility, then prevailing rate applies (currently $121/mo. ), unless cancelled or changed prior to end of the promo period. Must maintain all qualifying services and service addresses must match to receive advertised pricing. Pricing subject to change. $5/mo discount: Must enroll in autopay & paperless bill within 30 days of TV activation to receive bill credit starting in 1-3 bill cycles. First time credit will include all credits earned since meeting offer requirements. Must maintain autopay/paperless bill and valid email address to continue credits. No credits in 2nd year for autopay/paperless bill. Includes: SELECT All-Included TV Pkg., Internet plans (768k-50M), monthly service and equipment fees for one Genie HD DVR, monthly fees for a Wi-Fi Gateway, and standard pro installation. Exclusions: Price excludes applicable use tax expense surcharge on retail value of installation, custom installation, equipment upgrades/add-ons (min. $99 one-time & $7/mo. monthly fees for each extra receiver/DIRECTV Ready TV/Device), and other add'l fees & charges. Different offers may apply for eligible multi-dwelling unit customers. $94.99 1-YR BUNDLE PRICE: Ends 6/30/19. 1st & 2nd year Pricing: $94.99/mo for first 12 mos. only. After 12 mos. or loss of eligibility, then prevailing rate applies (currently $140.99/mo. ), unless cancelled or changed prior to end of the promo period. Must maintain all qualifying services and service addresses must match to receive advertised pricing. Pricing subject to change. $5/mo discount: Must enroll in autopay & paperless bill within 30 days of TV activation to receive bill credit starting in 1-3 bill cycles. First time credit will include all credits earned since meeting offer requirements. Must maintain autopay/paperless bill and valid email address to continue credits. No credits in 2nd year for autopay/paperless bill. 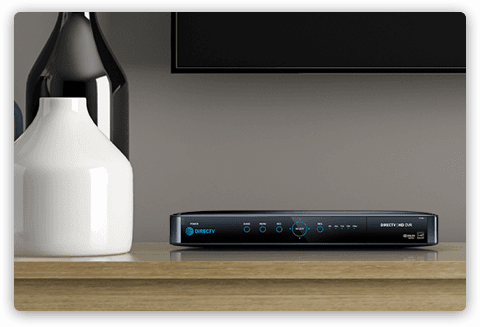 Includes: SELECT All-Included TV Pkg., Internet speed tiers (10M - 100M), and Phone Unlimited North America, monthly service and equipment fees for one Genie HD DVR, monthly fees for a Wi-Fi Gateway, and standard pro installation. Exclusions: Price excludes applicable use tax expense surcharge on retail value of installation, custom installation, equipment upgrades/add-ons (min. $99 one-time & $7/mo. monthly fees for each extra receiver/DIRECTV Ready TV/Device), and other add'l fees & charges. Different offers may apply for eligible multi-dwelling unit customers. DIRECTV SVC TERMS: Subject to Equipment Lease & Customer Agreements. Must maintain a min. base TV pg. of $29.99/mo. Programming, pricing, terms and conditions subject to change at any time. Some offers may not be available through all channels and in select areas. Visit directv.com/legal or call for details. *$19.95 ACTIVATION, EARLY TERMINATION FEE OF $20/MO. FOR EACH MONTH REMAINING ON AGMT., EQUIPMENT NON-RETURN & ADD’L FEES APPLY.Price incl. SELECT Pkg., monthly service and equip. fees for 1 HD DVR] & is after $5/mo. autopay discount for 12 mo.Pay $40./mo. + taxes until credit starts w/in 3 bills. New approved residential customers only (equipment lease req’d). Credit card req’d (except MA & PA). Restr’s apply. SELECT ALL-INCLUDED PACKAGE: Ends 6/30/19. Available only in the U.S. (excludes Puerto Rico and U.S.V.I.). 1st & 2nd year Pricing: $35/mo for first 12 mos. only. After 12 mos. or loss of eligibility, then prevailing rate applies (currently $81/mo. ), unless cancelled or changed prior to end of the promo period. Pricing subject to change. $5/mo. discount: Must enroll in autopay & paperless bill within 30 days of TV activation to receive bill credit starting in 1-3 bill cycles. First time credit will include all credits earned since meeting offer requirements. Must maintain autopay/paperless bill and valid email address to continue credits. No credits in 2nd year for autopay & paperless bill. Includes: SELECT All-Included TV Pkg., monthly service and equipment fees for one Genie HD DVR, and standard pro installation. Exclusions: Price excludes applicable use tax expense surcharge on retail value of installation, custom installation, equipment upgrades/add-ons (min. $99 one-time & $7/mo. monthly fees for each extra receiver/DIRECTV Ready TV/Device), and certain other add'l fees & charges. Different offers may apply for eligible multi-dwelling unit and telco customers.